WEST LAFAYETTE, Ind. 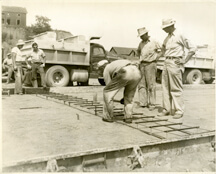 – Purdue University's Libraries and Special Collections is commemorating 100 years of hosting the Purdue Road School with a special exhibit focusing on Indiana transportation. "The Crossroads of America: Indiana Transportation in the Early 20th Century," is on display through March 13 in the Virginia Kelly Karnes Archives and Special Collections Research Center on the fourth floor of the Humanities, Social Science and Education Library in Stewart Center. The exhibit coincides with this year's road school, set for March 11-13, on campus. The exhibit profiles early transportation in Indiana and includes rare publications on railroads and canals; historical road maps of Indiana; photographs of road construction projects and equipment; documents pertaining to the opening of major highways; and documents chronicling the history of the Purdue Road School and the Joint Transportation Research Project. Themes such as the evolution from horse and buggy travel to streetcars and automobiles, surveying and methods of traffic control, and road and bridge safety, are explored, along with the impact the rise in popularity of the automobile had on rural life. The Purdue Road School is an Indiana tradition that brings together federal, state and local agency personnel, elected officials and professionals from throughout the field, including industry, consulting and academia. It builds upon a rich tradition dating to professor W.K. Hatt's efforts to organize a civil engineering conference in 1913. Purdue Libraries curators for the exhibit include Sammie Morris, associate professor and university archivist, and head of archives and special collections; Neal Harmeyer, digital archivist in archives and special collections; and Michael Maune, graduate assistant in archives and special collections.